I felt like I would stay here forever. The green fields were spilling over the distant hills and the thick grass was covering the ground like a blanket. There was this refreshing scent in the air, a mixture of morning dew and ocean breeze. The sky was cloudy, but we could see few sun rays pocking between the white clouds. We had just spent the night in the middle of nowhere – under the stars and the sound of the crickets, but it was thousand times better than any fancy hotel. It took us few hours, three sandwiches, two rest stops and a bag of chips until we reached Sydney. By that time the sun was up in the sky. 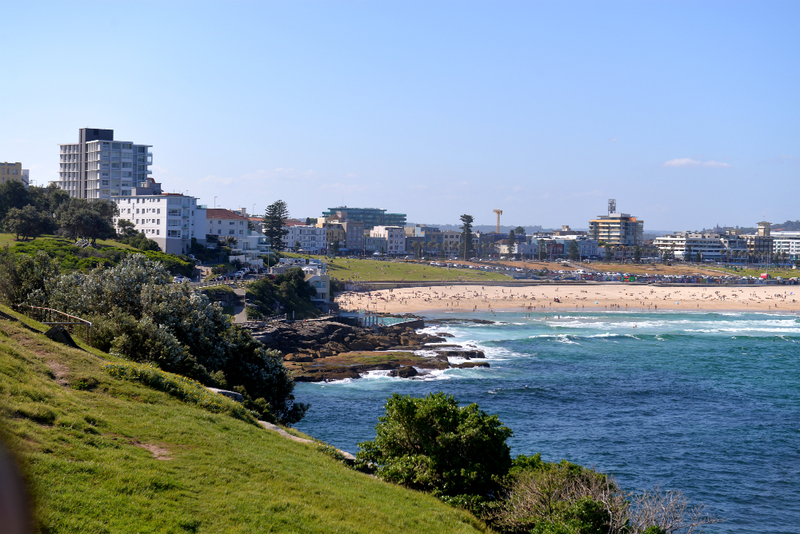 Inspired by the warm weather (and maybe because we had our swimming suits on) we decided to start our exploration of Sydney from the famous Bondi beach. So I am not sure if there is a saying like that, but I think it should totally be a thing – when at Bondi beach walk barefooted. So we did park the car at the overcrowded parking, overlooking the lagoon at Bondi beach, and let me tell you, it wasn’t cheap to park there. But hey, you don’t get to visit Bondi beach so often. As we had already exhausted all our provisions, and I really couldn’t be bothered to put my shoes on, I ran across the street to the nearest shop. Which looked more like a souvenir gift shop/money changer/ the last place on Earth from where you would buy an extremely overpriced bottle of Coke. We didn’t bother to take out the sun umbrella from the boot and it was pointless to battle the strong winds coming from the ocean. So we settled on our beach towels and enjoyed our cold drinks. But who knew that watching blonde haired, t-shirtless surfers can get boring so fast! The nice coastal walk saved the day and gave us the opportunity to not only marvel at some well toned bodies, but also to explore a little bit of the sea creatures that can be found in these parts of the world. We stumbled upon a strange looking jellyfish and a beautiful blue dragon. The second one got back in the ocean, after we gently scooped it along with a bit of sand and returned it in the water. 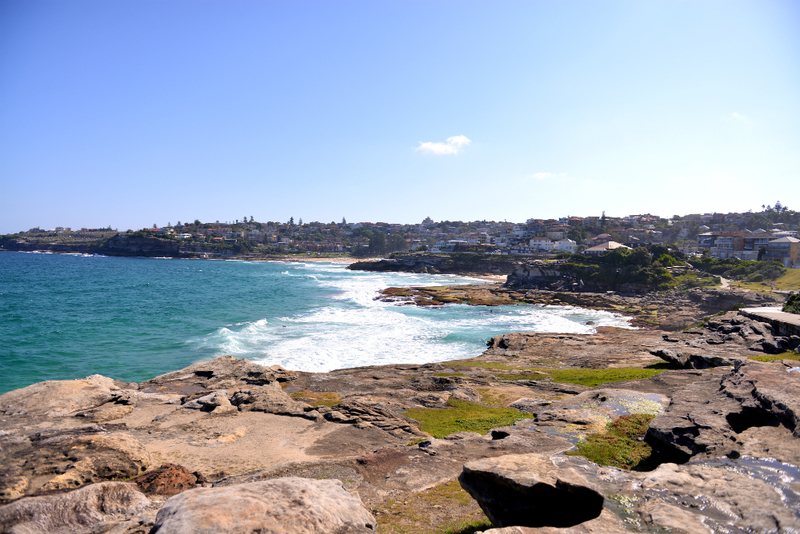 We decided to top off the nice experience at the Bondi beach by exploring a bit of the well manicured lawns and the cliff walk. So yes, there were many tourists and wet dogs running after frisbees. 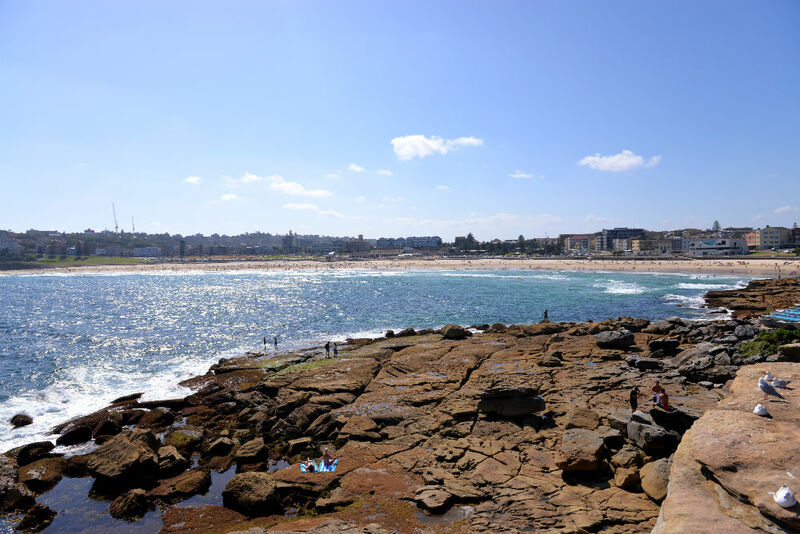 And maybe the waves were just a little too big for a regular person to try and swim without drowning – but I can definitely say that Bondi beach is one of the best places in Sydney. Just don’t forget to bring your own food and drinks and leave your flip flops at home. You know what they say, when at Bondi beach, walk barefooted. Sounds like a fun day … can’t wait to do this when I get to Australia!